In this episode, you’ll learn about focusing your limited marketing dollars on the visitors who are closest to your destination from Devon Perry. Devon Perry joined Visit South Jersey as marketing director in 2015. In this role, she closely shadowed the executive director, and when the opportunity presented itself, she was well acquainted with the position and truly the best choice to lead Visit South Jersey into the future. Devon has an unstoppable passion for entrepreneurship, social enterprise development, fine art, and positioning. While skilled at crisis management, Devon also is exceptional at telling beautiful stories to public and private stakeholders, engaging customers, and improving community affinity. Devon has created several non-profits and for-profits with strategic partners across industries. Devon’s background in nonprofit marketing speaks to her interest and expertise; she’s managed marketing efforts on staff at both The United Way and The American Red Cross. Her decade of experience includes many startups, including the thriving co-working space Kings Hall in Haddonfield, NJ. Devon holds an MBA from Drexel University, grew up in Cherry Hill, NJ, and currently resides in Haddonfield, NJ. She is currently the artist in residence at the Historic Hopkins House along the Cooper River in Haddon, NJ. Devon is committed to service above self as seen in her involvement in multiple organizations: Rotary of Haddonfield, Board of Governors of the Haddonfield Civic Association, Young Friends Council of the Ronald McDonald House of South Jersey, Charity Chair of South Jersey Mothers of Multiples and member of the Board of Trustees of Visit South Jersey. Other notable efforts include: Drexel Women in Business (Co-Founder), ShareURmeal (Founder), GoBYO.com (Founder/CEO), Women’s MBA Network (Founder). Board member for NJ Tourism Industry Association (NJTIA), and in the Destination Management Association International’s Leadership program, training C-level executives around the globe. Thank you so much for joining me, Devon. I am thrilled to be with you today. Thank you. I love your background and actually I didn’t know you were an artist. You and I have been getting to know each other over the last probably 12 or 18 months, but that is something new that I didn’t know. Oh, it’s one of my favorite connectors to tourism in the area. I love the history of the Hopkins House. That’s where our offices are in Camden County, New Jersey, overlooking Cooper River. On the third floor, there’s great space to create and you have a wonderful view of the Cooper River and all the trees aligning the Cooper River. I also love sculpture and have dabbled a little bit in printmaking, but yes, I like to get my hands dirty, and I love color. Wow. That’s really awesome. I love that connection between art and tourism. I love your background. It’s so varied. I’m wondering if you can tell us a little bit more about your story and your journey to how you got to where you are today. When I was an undergrad, I attended Muhlenberg College and I knew I loved marketing. I decided instead of studying business and marketing that I would study cognitive psychology and fine art, which could point me in that general direction. Later I realized that I needed a business foundation, but between going to Drexel for my MBA and finishing my undergrad, I had some experience working with artists who didn’t have a strong foundation in business or were just very hesitant to sell their own work and didn’t know how to get started. That was my first venture called The Creative Process. I connected artists with businesses seeking their talent, anything from branding to a sculpture and an atrium. That’s when I realized I really needed to sharpen my skills and went back studying business at Drexel and UPenn. After graduating from there, I worked in a family business in catering around the front of the house and also worked at events, so I interacted with guests and really enjoyed providing an elevated experience. It’s a family business, so I learned a lot about the dynamics of my family and have a great appreciation for what they do day-to-day. I love the area. I love South Jersey. I love greater Philadelphia. Flash forward, I settled down in Haddonfield and started a coworking space called Kings Hall. That’s how I met the former director of Visit South Jersey Jake Buganski, who’s now the Director of Tourism for the state of New Jersey. The chairman of his board at the time suggested that we connect and we talked about coworking as it fits into the tourism industry, business centers so to speak as a satellite location for folks who are traveling through the area. That was originally how I got involved with the organization. I started painting on the third floor first and then graduated into my role in marketing and communication. Wow. That’s really cool. You never know where a path is going to take you, right? To hear you tell that story, you can see how the dots connect, right, over time. I just think that that’s really incredible. I love this whole idea. You said you took cognitive psychology and fine art and then you’ve mixed that with your MBA, and now you’re an executive director for a tourism organization, which I just think is fascinating. I know this is going to be a fantastic conversation. I think the program with Destinations International, the CDME Program, is extremely valuable to round out my educational background or my formal work experience as well so that I can learn more about best practices in the industry. Even though I have crisis management in my background, crisis management in destination marketing is very different. I’ve been able to watch our colleagues across state lines manage some situations, and it’s been very interesting to learn more about the good, the bad, and the ugly in our sector and how to really help our footprints survive and thrive through those moments too. I think that’s a really good point too. What you just made me think about is how diverse your skillset really needs to be to be a true destination marketer and leader and it goes well beyond just say the marketing and the communication side because you were referring to crisis management, which also can fall on a destination marketer or leader as well, and just how broad your skillset really needs to be. Then the other thing that strikes me about what you’re sharing is that the learning doesn’t stop. I think an important takeaway actually is that it’s not just about getting that degree and getting into that position, but things are evolving and changing all the time. Those who are committed to learning and continually learning I think will be that much more successful. I agree. I think this is true for probably every sector or every industry. Thinking about our industry in particular, when it comes to sharpening our skills and making sure that we’re on top of what’s current from every angle really when it comes to technology is so critical. Making sure that we do our homework before getting into a new space whether it’s geofencing, whether it’s app development, strategic partnerships with tech companies that are moving into our space or growing into our space. It’s absolutely critical that we remain connected as professionals. As we all do our homework, we share notes with each other so that we can cautiously move forward and steward each of our destinations into these new technologies responsibly. Yeah, I have been thinking a lot about that. I’m so glad you brought that up. If I were to read my bio to you, you would find out that I am the board of president of an organization in my community called Digital Rochester, and it’s a technology organization. My company works only in travel and tourism. Sometimes my colleagues on either side, either in the tech space or in the travel and tourism space, don’t see the connection between the two or why are you spending your time with this professional association that doesn’t have to do with travel and tourism? I’ve been thinking a lot about it lately and there really is such an important connection between what’s happening in travel and tourism especially as how we market, how we represent destinations, and what’s happening in the technology space and being able to stay ahead of it is not easy to do. I find immersing myself with a bunch of tech people keeps me kind of informed. Right. I think that being young in technology, you can see how we look at whether we’re looking at generational differences or looking at just how we work within different tools that are available to us. You can see that the younger generation they know how to swipe a phone. They look at a phone. They don’t put it up to their ear right away. I know these are funny things to mention in this scope, but those behaviors are important for us who need to keep our skills sharp, who need like a useful eye so that we make sure that we’re using the tools that are available to us properly as individuals, but that our organizations are able to leverage the great depths of information that we all have about our destination and distribute that information through these new channels in ways that the next generation of visitors will want to consume it. I love that you’re surrounded by people in other industries too because that might spark an idea for you for our industry that maybe no one has thought of before. That’s really exciting. Well, I’m really looking forward to this conversation. This first section is all about creativity. Given your background and just how creative you are just instinctively, which I always find is challenging too because it used to be the left side of the brain, the right side of the brain. Usually, you’re more left or more right. You’re balancing. You’re either black and white, and very linear or you’re really creative and maybe not so organized. When I meet people like you who can kind of really balance those two things and bring them together, I think it’s really interesting. I’m looking forward for your answers to these questions in this next section. The very first one is actually in reference to our industry, the tourism, and hospitality industry, and how very competitive it is. Visitors have so many choices of places that they can visit and they have so many competing interests even just for their time as to what they’re going to do to spend their time with. For destinations to convince somebody to spend their valuable time visiting their location can be very challenging. I’m wondering what kinds of things you have done, what kinds of creative things you have done in South Jersey to really kind of stand out from the crowd. One of the things that we find to be beneficial that is naturally built into our destination is that we’re one tank of gas away from 43 million people. We have destinations surrounding us in other states, beautiful internationally ranked, Philadelphia, New York, DC, even the beaches within New Jersey. What we need to do because of our budget, which isn’t commensurate with the footprint, we cover over 123 municipalities, is leverage the spend and the positioning of those major international destinations across the river, up north and down south. When there’s a major event in those destinations, we track them. Instead of investing in traditional forms of paid marketing, we invest a great deal in our public relations strategy. We will make sure to reposition the story. It doesn’t have to be a current story or news per se. It can be something evergreen about the wine region, which we have really set the table about beverage tourism in general. We have over 60 wineries, breweries, and distilleries in our footprint. When folks are coming into the convention centers in Atlantic City, in Philadelphia, we position those stories on social media so that it is showing up in their feeds that South Jersey is just a few minutes away from the front door of their hotel. With public transportation or Uber or Lyft, they can arrive in South Jersey and really experience a Napa Valley of the East style wine tour. What you said before is so true. There is not much more valuable than someone’s time and the desire to and commitment to invest time in our destination we value a great deal. There are also those visitors who are in the area because their companies have invested for them to travel to South Jersey. We have a lot of folks in the area during the week that are prospects for leisure travel. One of the other things that we’ve begun to do is develop point of sale or front desk strategies for speaking to those folks to let them know that they can also return to experience the lighter side of the footprint. They’re committing their 9:00 to 5:00 with us. Let us tell you about what there is to do when you clock out or let us tempt you to come back. Those are some of the things that we’ve been doing, leveraging our neighbor commitments to the convention side and really converting the business traveler into a leisure traveler when they’re in market. I think those are two really great examples and strategies that you just brought up. I find that I talk to so many DMOs that have those smaller budgets and really have to be creative with how they spend their dollars and how they make those dollars stretch. The first point that you made here about leveraging those nearby destinations that have much bigger budgets than you do, but figuring out how to grab the attention of those travelers are only as you mentioned that tank of gas away from South Jersey I think is just a really great way to go about it. It’s much easier, isn’t it, to capture somebody who is close by than to try and reach them from wherever they might be coming from, whether it’s an international location or somewhere else in the US. Absolutely. We have a lot of assets, a lot of our attractions are doing in market promotions as well as reaching across the river, and potentially exhibiting at trade shows, but for many of the medium-sized and small sized businesses that offer high-quality experiences, they don’t have the budget to attend those trade shows. We’re also exhibiting on behalf of those folks, which is not unique. I know that a lot of us are doing that for our footprints. What I do find to be beneficial and important I think not only for our organization but also for the visitor is that we are taking a very good look at video content and bites or moments at some of these attractions especially those that have a difficult time investing in casting a wider net to attract a visitor from even just outside of our state. That’s where we are really dedicated to positioning those attractions, making sure that their stories are told through images, and hearing from them and really listening to them in terms of are they seeing an increase in visitation, do they have particular peaks and valleys in the area and how can we help improve the visitor experience, and also improve some of the values and visitations. I think that’s really tremendous as well, especially kind of digging in and getting to know what’s important to them, what audiences are attractive to them, and then what are their peaks and their valleys so that you can really figure out how you can best serve your footprint, as you said. I’m also wondering if we can go back to this. You talked about getting those repeat visitors from the business traveler and kind of converting them into leisure travelers. I think that that was a really great idea and kind of golden nugget of information if you will. I’m wondering if you talk a little bit more about how you are reaching those front desks or those point of sale locations. What type of outreach are you doing? Maybe you could just describe that a little bit more for our listeners. Absolutely. One of the things that we have launching this spring is probably something that some of our colleagues have done in the past. We’re doing what we’re calling field trips instead of FAM tours for the front desk of hotel partners and attraction. When someone comes to the front desk when someone comes to the check out desk at an attraction and they ask, “Where can we go to eat? Can you recommend a good place to visit? We have kids. We’re looking for live music,” we make sure that those folks are equipped not only with signage at the front desk area encouraging the download of our app, but also that the people themselves that are speaking with the visitors, the front line of our industry, they have experienced other attractions outside of their employer’s footprint. We’re also going to be doing that with our restaurant partners as well. It’ll be an industry field trip. We’ll be providing it on “off days,” so like a Sunday or a Monday for some of the sectors. As the program develops, we’ll also get feedback from the folks that have participated in the program and then we’ll fold that back into the next iteration I think. That strategy of point of sale materials is a no-brainer. Making sure our visitor guide is where it needs to be. Having signage at the front desk to download our iPhone app, and then have field trips for our front line, folks working at the front desk and check out at other attractions. Right. Right. Right. Obviously, we want to reach everyone. The tactics in order to achieve the goal it’s easier said than done because you need to really create a strong relationship with the DMs at the hotels and the directors of sales and marketing and make sure that they understand that look, there’s a lot of noise out there in the marketplace. Everyone’s trying to sell an experience. How can we help our attractions and our footprint sell and optimize their experiences? I think it’s truly we are helping each other. We’re all ambassadors for South Jersey. There’s so much experience around here. We have indoor water parks. We have Diggerland, the place where you can operate large machines. It’s a playground of like heavy duty equipment. We have a wonderful place called the DREAM Park, an equestrian facility. We have, like we talked about, the wine region. We have three wine trails that also have breweries and distilleries. Pulling that all together and ensuring that the man that lives at the base of the mountain is the last one to climb it. We’re trying to get those folks outside of their homes, outside of their employers, and scaling the mountains so that they can tell people about it, they could post pictures about it because those images and those words are probably the most valuable. We can compete on that level. The other things, billboards and commercials during major prime-time programs, we’re not necessarily in that caliber or at that level, but there is something to be said for the ambassador who has experienced something on their own who is willing to post and share and recommend. We want to do everything we can do to facilitate those good words and those beautiful images. That’s really where we’re investing a lot of our energy. That’s great. It sounds like you’ve identified an area where you can get the best return for the budget that you have to invest. Yeah, I think that’s a really great strategy. Switching gears just a little bit, and you’ve already actually hit on it a little, but I like to focus a little bit on a challenges and think about a challenge that you may have faced and the creativity that came from it because I find that we learn so much when we’re faced with some sort of a problem to solve. I’m wondering if you can share a challenge. Absolutely. One of the areas that is the most challenging for us in the state is our funding. When it is all said and done, we can be creative. We can talk about earned public relations. We can talk about ambassadors and outline our tactics in order to achieve certain goals and results with a good return. However, with less than 10% of the average DMO budget, that has been a tremendous challenge for us in the state. I think having a background in the nonprofit sector, although I’ve worked a great deal with some of the larger nonprofits, I’ve also worked with nonprofits that are smaller, that are lean. Some of them are crowdsourced where you have a bunch of people that are giving a little bit of their time and investing a lot of their talent in that little bit of time. Given the challenge that I just described, we have seen such a depth and just so many beautiful investments from our board. Our board, it’s a big board of directors. We have almost 50 people on our board, and it ranges from the CEOs of the Chambers of Commerce in our footprint, owners of wineries, breweries, and distilleries, folks involved in economic development, people committed to the arts, culture, heritage. We all are investing our talents at the table. When we leave the table, when we leave our meetings, you can really see in the way that even at a cocktail party the members of our board are speaking with key people in the public sector to make sure that everyone is well-versed at some of the funding issues across the state. Meanwhile, the show must go on. I think a lot of our colleagues can relate to this. We still go into the office. We still are moving our missions forward. I remember one of my bosses said this a long time ago that you have two missions when you work in the nonprofit sector. One is the mission of your organization, and the other is to raise funds to support the mission of your organization. Although we’re in destination marketing, it is absolutely the same scene that I see here too. Coming up with creative approaches for generating revenue, that is how we will surmount this challenge. I think we have some approaches that we’re going to be launching in 2018. We are launching a South Jersey visitors channel with our partner who provides also the Philadelphia visitors channel. They serve right now 76 hotels in the greater Philadelphia market. We’re going to be offering that service to the DMOs and CBDs across the country. It will be a revenue generator for Visit South Jersey based on the fact that we are in this challenging situation financially, but we’ll also be skilled and lean and we can recognize even the smaller footprints that have a handful of hotels, and we can help them execute the same visitor channel framework that we executed. One of the hidden benefits with my crisis management background and disaster relief at the American Red Cross is that you can actually control content and shift it in different clusters, in different counties, in different regions depending on the need. Most of the time, God-willing over 90% of the time, it will be because there’s a Pop-Up Farm To Fork Dinner or Lady Gaga is coming to town and doing an incredible show on the Camden Waterfront. When there are moments where we need to inform folks immediately for other purposes, to prepare for something that is happening whether it be a manmade or natural incident, this system will allow for us to do that in the South Jersey footprint. Because we’re going to be providing that service to other CBDs and DMOs, that will be a service that we can provide to those folks as well. We’re really excited about that. I think it’s one of the challenges that look, if we were funded properly, if things were well oiled, if I entered into this industry with all of those ducks in a row, well, we needed to think like this and I think that this service with our partner, who’s knowledgeable in providing the service, I hope that is not just helpful, but it actually helps people in their time of need. That’s really cool. Tell me, is the visitor’s channel, is that something that just gets broadcast through hotels or is that something that’s more broad throughout the whole community? It’s going to be targeted in hotels and attractions and other accommodation partners. As we launch it, we’ll see if there’s additional interest because we want to be very targeted with our content. It will speak primarily to the visitor, but the content will be valuable to the resident as well. We may find other avenues for broadcasting with content or rebroadcasting and redistributing some of the content that will be featured on the visitor channel. 50, I’m sorry. 50 people. On the one hand, it seems like, “Wow. That’s a large board of directors,” but you’re also using that as an asset to you because you’ve got these 50 very invested ambassadors out there speaking to folks about the needs and the impact that your organization is having. I think that that’s just great. Anyway, the fact that you have this challenge, this funding challenge, but have come up with this creative solution. I mean I see so many opportunities with this because, in today’s day and age, it’s all about content. Where are we going to distribute? Content distribution. You’re actually talking about owning the distribution channel for your own content, and then being able to offer that as a service and create revenue to me sounds like a win-win-win all around. We’re excited. On your show actually, this is the time that we’ve shared that. We believe that this is a phenomenal opportunity to speak to your listeners and to speak to the industry. We’re really excited to see all of this unfold. I promise to keep you updated on the progress there too. That’s fabulous. I will definitely look forward to hearing more about that. You’ve already talked and touched on this a little bit, but another area I like to focus on in this show is collaboration. Not just collaboration, but this whole idea of what I call coopetition because I find in the travel and tourism industry that so often these perceived competitors might come together and form relationships and partnerships to create something that’s bigger than something they could have done on their own. I’m wondering if you can share any examples of collaboration or coopetition that you have been involved with? I think one of the most exciting is the Vintage Atlantic Wine Region. That is a four-state collaboration started a little over three years ago between South Jersey, Pennsylvania, Delaware, and Maryland to brand the Mid-Atlantic’s wineries, breweries, and distilleries. The Vintage Atlantic Wine Region is our effort to collaborate and leverage those assets and expose them with that brand to the international traveler so that they can see a reason to spend one to two weeks in the four-state area. In addition to experiencing the major cities and the major attractions, that the wineries and breweries, and distilleries are also beautifully woven in between. The other connective tissue, we have the historic assets, the arts, culture. There’s so much to experience in the four states that I mentioned, all of them coming to the table and developing the Vintage Atlantic Wine Region map and there’s a video series on the Vintage Atlantic Wine Region. There is so much potential ahead with that and it is absolutely one of our favorite collaborative projects that we have. That’s really cool. Can you tell me how that came about? How did these four states decide to come together? I mean I think it’s a great idea and especially when you talked about specifically looking at ways to attract the international traveler because I do believe when you’re doing international marketing, you need to think much broader, right? How did you connect those dots with those four states? Where did this gem of an idea come from? 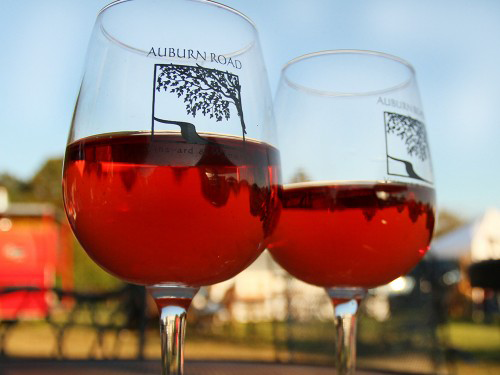 Scott Donnini is the owner of Auburn Road Vineyard and Winery in Salem County, South Jersey. He sat down with Sarah Willoughby of Delaware and Jake Buganski was leading Visit South Jersey. They created this concept based on the Finger Lakes. Scott many, many years ago went on a trip to the Finger Lakes with his wife Jules who is actually the winemaker at Auburn Road. They came back and started to think about the composition of our area of the four states and how similar it is to Bordeaux, France if you turn the map upside down, which is kind of a thing we have people do when they have a couple of the Vintage Atlantic map. I’ll send you a copy so you can do it too. It’s really fun. It was really inspired by the Finger Lakes many years ago. The wineries got to the table with our industry and just really made it happen. When I started with Visit South Jersey, the first map was in progress. It was being pulled together. Organizations and businesses could advertise on the map. The whole story of the Vintage Atlantic Wine Region was printed on the map. Now we’re in our third run and it has been extremely exciting and there’s a lot of work to do. There’s potential for grant funding on the federal level. There’s potential for support on the state level. A lot of positive conversations. It’s rare that you see something like this happen across state lines. Private sector funding options, public sector funding options are all being examined in order to keep this healthy and evolving moving forward. Yeah, that’s really interesting. There are actually several things I find interesting about that. To start that it was a winery owner that went to the Finger Lakes and used the Finger Lakes kind of as a benchmark, which really got his creative juices going. To have it come from one of your assets, one of your stakeholders, and then for him to be able to connect with Jake at South Jersey and it kind of expand from there, I just think that that’s a really great example of how things can start and then build when you get the right partners to the table. Then what an interesting scenario too though once you get this thing built, how do we fund it. On the one hand, there are so many new opportunities for funding because of the nature of the project, but on the other hand, it’s not as clear-cut anymore either. That’s a really great example. Do you have any advice for our listeners about what they should look for in a partner if they’re thinking about trying to come up with their own version of a Vintage Atlantic Wine Region, whatever that might mean to them? Any words of wisdom that you can share? I think, make sure that you sit together in an environment that allows for you to unlock your thoughts and your ideas. Try not to be limited by the current climate, by current structures, and find a collaborative partner that you’ve seen execute and follow through in other projects. Make sure that your brands are similarly elevated in whatever categories are important to your destination. When you’re working with someone, when you’re working with a partner, when you’re collaborating, there’s a lot that you can execute on from an operations perspective. There’s a lot that you can solve if there are issues. One thing that needs to be there from the beginning is your brand equity, your brand voice, there needs to be alignment before moving forward. I have seen a lot of beautiful collaborations across states and positioning of experiences or attractions that are clustered together that really work. Take a look at some of the things that you think are exceptional, and then call those people and find out because a lot of times we’re Wizard of Ozing no matter how big or small our budgets are. Ask them for a peak behind the curtains. Some of the things are beautifully executed because a lot of us really are diligent at that end of the value chain may have been a lot more difficult behind the scenes and may have taken a lot more time and dollars than were anticipated out of the gate. Talk to your colleagues, talk to your classmates if you’re in CDME program, and get an idea for what the real story was behind the program. Not saying that learning that there was a hiccup should limit you from moving forward with your new collaborative partner, but the knowledge of it could help you mitigate those road bumps as your project unfolds. Find someone that you enjoy spending time with too because it does involve a commitment of time. Like you said earlier, time is extremely valuable. We’re lucky when folks spend time at our footprints, but we should cherish the time of a collaborative partner as well. I think those are some of the things that I would kind of keep in mind if folks that are listening are looking to start a new partnership in the new year. Those were all very fabulous advice. I want to just make sure that our listeners didn’t miss some of that. I’m going to say some of this back to you to make sure we captured it all. You started with this whole idea of sitting together. It wasn’t just getting to the table though. The way you described it was really making sure you’re in the right environment that allows the folks that are coming to the table to think creatively. I liked that you said don’t let those current structures kind of hold you back. I think that that was just really very wise and good advice. I also liked what you said about the brand alignment. You’re not saying that your brands have to be the same or perfectly aligned, but what I heard was more so complimentary to your partners. Then this whole idea of finding partners who have had or looking for people who had similar success maybe in other projects and not Wizard of Ozing, I love that, but actually picking up the phone and calling. Because so many times, you’re right, we just sit in our own minds and kind of daydream and think. Maybe we’re reading things on the internet. You get a lot more information if you just pick up that phone and make that phone call. People do seem to really like to talk about things that they’re working on. Absolutely. Case in point, right? Yeah, exactly. That’s what we’re doing right now. Exactly. I think those were really great nuggets of information that you just shared with us. Speaking of time, we are coming to the end of our conversation. Before we say goodbye, I just wanted to ask you if there is anything else that you would like to share or say to our listeners before we close out? Well, I think that it would be a disservice to all of our friends in South Jersey if I didn’t say please download the Visit South Jersey app on your smartphone. Visit our website. Like us on social media. We hope that as you plan your next trip or if you find yourself within one tank of gas from South Jersey that you come and visit us. Feel free to reach out to me and I can help guide you along your journey as well. Thank you so much for having me on your show today. It was really fun to talk to you. Thank you very much, Devon. I enjoyed talking to you as well.